Although a few minutes of mapping out your day will benefit everyone, there is more that can be done. Some are dependent on calendars — paper or electronic — for a daily schedule, and calendars or planners can be a valuable tool in time management. Using your calendar to define your path forward can help you cover all the bases and be proactive with your priorities. Planning ahead pays off. Well, if you block time on your schedule on a monthly and weekly basis, you are making sure you stumble over what you need to do. Some of us need that extra help! Often distractions consume our days, but if your calendar simply reminds you that you need to spend an hour paying bills today in spite of those distractions, you have a helping hand. This can work in different ways. For instance, if you have regular tasks that need to be completed, like paying bills or a medical treatment, you can schedule that time out a few days before the deadline each month. Scheduling it a couple of days early gives you margin if a need comes up to push it back a day. No worries; you planned for that possibility. If you have something on which you want to spend regular time, i.e., walking with a neighbor or meal planning for the week, blocking that time out for the next month will protect that time slot and activity. If you have a larger project or goal, you can break it down into smaller chunks and schedule time to work on it. So if you have a book to be read for a reading group at your local library, and you know 1) the book has 9 chapters and 2) they will take about 30 minutes each to read and 3) you have three weeks until you meet, you put time to read on the calendar 3 times a week. Remember, don’t put the last block of time on the last possible day; give yourself margin to succeed. If you are using a paper planner, you often have space to list your priorities and to-do list on the same page as your calendar. This helps keep these front and center in your mind. It also helps you double-check that the priorities are reflected in your schedule. Regular reviews are also crucial for calendar management. If you have planned out the next month, you will still need to look at your calendar each week to see what has changed or what may need to be changed to adjust to new requirements. Things come up. Stuff needs to move. The soccer schedule was laid out for the season, but games and practices get rescheduled. This doesn’t change the goal, it just changes the plan to get there. Remember you are in control of your calendar, so take care of conflicts and holes as soon as you can. This keeps your schedule running smoothly even with multiple adjustments. Even with a weekly review, you will still need to look at your calendar at the beginning of each day to make sure all is still well and that you know what you are doing in the short term. Color-coding can also be helpful. 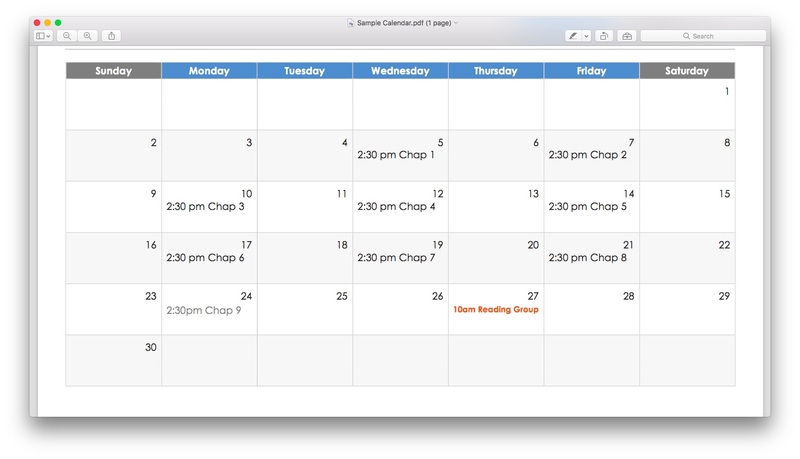 Visually, your brain will have clues to immediately categorize tasks and appointments. You can choose one color for each specific arena or goal. Paydays could be marked in green and school vacations in red. Each family member could have one color, to keep all the karate and dance lessons easily seen. However, if multiple pens and the effort to switch and maintain the system is too much, don’t let it hold you back from a successful schedule. One pen works well — as does one of whatever writing instrument is handy at the moment! It is better to have it planned than pretty. Best wishes on your successful calendars! Do you have any other tips that help you? Please comment below for the benefit of us all.